Image: Tiro Ramatlhatse Schweizer-Reneke residents protest at a local primary school yesterday over segregation. Black parents who are not happy with how a North West school separated black grade R pupils from their white classmates have been told to take their children to townships schools. As protests raged at Laerskool Schweizer-Reneke over a viral image of black children segregated from their white counterparts at the school, white parents, some armed with guns, said blacks who were not happy with the arrangement should remove their children from the predominantly white school. The school was forced to shut its doors to learning yesterday as a result of protests as tensions threatened to boil over. "If you are not happy here, take your child to another school. Nobody is forcing you [to bring them here]," a white parent said. Another parent said Schweizer-Reneke had one white-dominated primary school and plenty of black-dominated schools. "Blacks don't put their children first, we put our children first, and their safety and education come first. This is the only white-dominated school in this town. "There are over 10 [black] schools in the township. If they are not happy, let them take their children there," said another white parent. North West MEC for education Sello Lehari was told that the reason black pupils were separated from their white classmates was because they (blacks) were struggling with Afrikaans. The explanation was given to Lehari during his visit to the school yesterday. 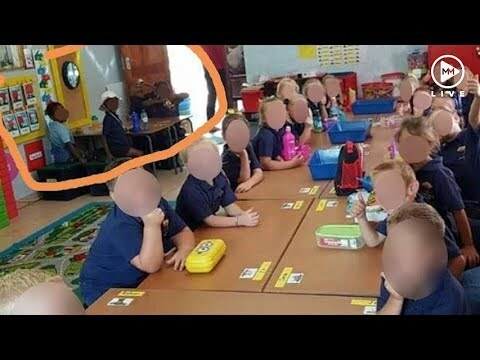 An image that has since gone viral on social media showed 18 white pupils occupying a single large desk in a classroom while the only four black children sit at a separate desk at the far end of the class. The picture - sent to a parent WhatsApp group and later distributed on social media - went viral and sparked outrage almost immediately. SA Human Rights Commission chairperson Bongani Majola said they will be sending a team to the school to investigate the matter. "If the findings come out that children were discriminated against because of their colour, this will be very serious," he said. However, the SGB said the picture "merely captured a moment and was not a true reflection of the school's ethos". Another picture sent later showed the children sitting at the same desk. On arrival at the school yesterday, Lehari found parents of white pupils breaking the school's fence and removing their children, while Schweizer-Reneke's black residents protested inside the school yard. Lehari announced the immediate suspension of the teacher who taught the class. He said he decided to do so because the explanation given for the separation of pupils did not sit well with him. "I was told the teacher did that because the black children did not understand Afrikaans, so they were teaching them separately from the white learners. I don't agree with that, and that's why I suspended her," he said. Lehari said the province needed wiser teachers who treated every pupil - irrespective of their race - like their own children. The MEC also expressed concern that some white parents came to the school armed with guns. He said he would determine the future of the school principal on Monday. Protesting parents told Sowetan that the racial segregation incident at the school was not isolated. Some incidents, they said, dated as far back as 2008. One of the residents, Kabelo Zondo, said at that time, black and white children were prevented from sharing a classroom.